Well, I've been lurking here at CMON for quite a while, and have submitted a few pictures. I've learned a lot from the various painters here, and have (most importantly) been inspired to try some new things. A while back, Eric Louchard (elouchard) posted some stuff where he talked about using a technique called "underpainting." 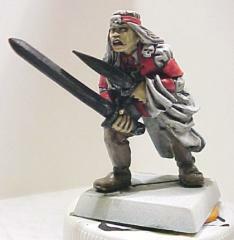 (You can see a full tutorial from him on his site at Lone Brushman.) I thought this would be a neat idea to try out. Another thing that I wanted to play with was using various mediums in the paint, such as Vallejo's Glaze Medium. I thought that underpainting would be a perfect way to test out this Glaze Medium. This article is a step-by-step recount of what I did on a GW Duelist that was dedicated to being a guinea pig. 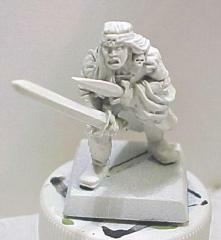 [pagebreak] Step 1: Priming the miniature Mr. Louchard started his underpainting tutorial by priming the model black. 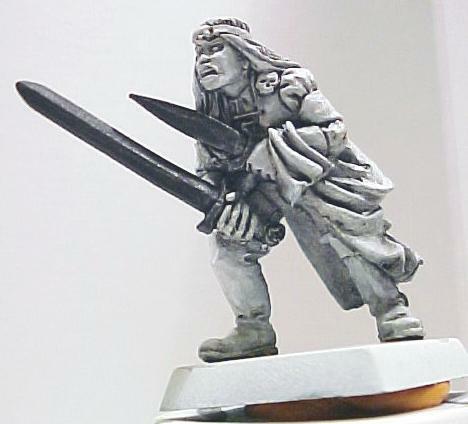 I generally don't like black primer, because I've found that coverage can be somewhat difficult with some colors. 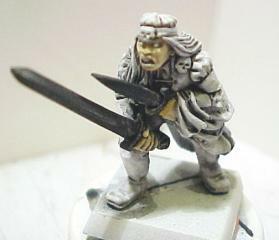 Besides, it was windy and raining out, and the Duelist was already primed white, so that's where I started. You can see the shot of him after priming below: Step 2: Black Wash After priming, I went at him with a very thinned-down black ink. I used a mixture of Future Floor Wax and distilled water (about 25%/75%) to thin the ink. Next, I slopped the wash over the whole model, as seen in this picture: Step 3: More Black "How much more black could it be? The answer is none. None more black!" (From This is Spinal Tap Seriously, though, I wanted some areas to be even darker, so I painted some slightly thinned black on the deepest shadows. I also did the swords black, since I'm planning on using metallics on this model (playing with one new technique at a time is a good idea!). Step 4: More White Now that we have a good set of grays and black from the steps above, we need to reinforce the lightest spots on the model by adding some white. 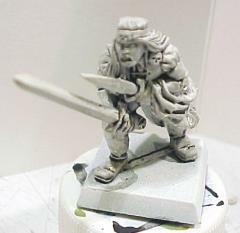 I thinned down some Vallejo white with a bit of the ol' Future mix, and layered it on top of the highest portions of the model, where I wanted the hilights to eventually be: [pagebreak] Step 5: Toning Now that we have a nice, high-contrast black and white model, we can start adding our colors. For every color I used, I added 50% Vallejo Glaze Medium. This stuff is pretty cool, now that I've played with it. This stuff increases the transparency of the paint to be almost like that of an ink, but doesn't thin it to that consistency, so it's easier to control than inks. It also slows the drying time a bit, though not as much as an extender would. The photos below show the various steps I used in toning the model. Generally, I used only 2 layers of toning. The first would be the normal "base coat" and the second was a slightly lighter (either adding white or ivory) to the base color. All of these were mixed with to about 50% with the Gel Medium. When using thin paints like this, it's best to have a damp cloth nearby. 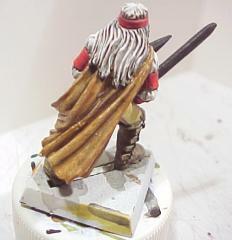 After loading your brush, lightly touch it to the damp cloth before working on the mini. You don't want to have a saturated brush, or else it will flow all over your model and be impossible to control! 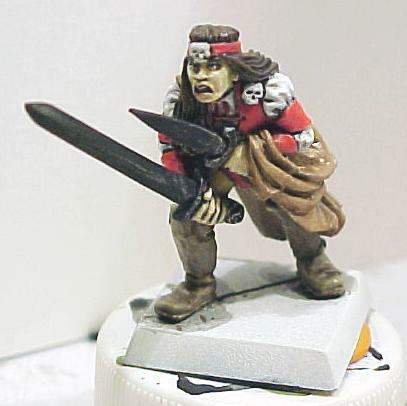 The skintone was done using Vallejo Medium Flesh Tone. After the first toning was done, I added some white to the flesh tone and picked out some highlights (with a layering technique). Next I started the reds for his vest and armbands. I used Vallejo Flat Red for the first coat, and picked out some highlights with Vermillion. The boots were next, and got Vallejo Leather Brown with a highlight of Leather Brown and Yellow Ochre (about 50%/50%). 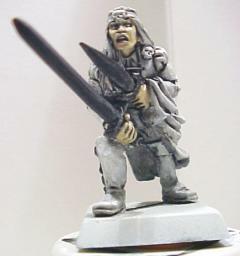 I then hit the shirt with some Vallejo Ivory, and highlighted with white. [pagebreak] The cloak and trousers were tackled next. The trousers are Yellow Ochre, with a highlight of Yellow Ochre + White. The cloak is Vallejo Beige Brown with a highlight of Beige Brown + Ivory. Note how the underpainting is adding our shadows for us, and the overall effect is fairly smooth! 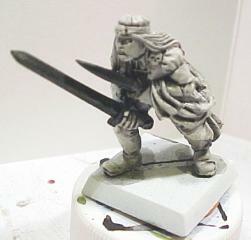 The piece is finished up with a metallics on the swords, hilts, and brooch and the thing on his headband. For the swords, I did about three layers: Vallejo Natural Steel, Vallejo Silver, and silver + white. The hilts and other golds were done with Vallejo Brass, a thin wash of brown ink (I used Reaper Brown Ink), and a highlight of Vallejo Gold. Added a mix of silica sand and aquarium sand, and he's on the street! I hope that this brief tutorial gives you some ideas about trying out new techniques. I did this mini in about 5 hours (including stopping to take pictures). It's not the greatest, but then again it's not too shabby. 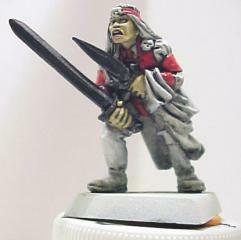 I think that with some practice, underpainting and glazes could be a really effective technique to get bold and bright paintjobs. 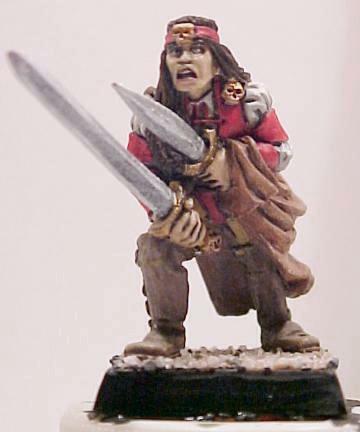 This particular duelist is a little more "cartoony" than I normally like to paint, but I can see how this style would work on some models. Once again, thanks to Mr. Louchard (I hope I got that spelling correct! ), and several others here on CMON for the inspiration.